Hope Grosse grew up across the street from the Naval Air Warfare Center in Warminster, Pa.
Over the years, evidence began to mount showing something might not be right in Warminster, Grosse told Bloomberg Law. All of the family’s pets died of tumors, Grosse said. Later, her sister developed an autoimmune disorder. When she was 25, Grosse was diagnosed with stage four melanoma—a cancer that is now in remission. Her father died from brain cancer the same year. Now residents living near military bases are seeking answers, and some aim to hold the federal government or chemical manufacturers responsible for what they say are the toxic effects of two chemicals used for decades in firefighting foam on bases around the country. The class action suits have been filed against 3M Co. and a variety of other manufacturers of aqueous film-forming foam, including Angus Fire, The Ansul Co., the Buckeye Fire Protection Co., Chemguard, National Foam, Tyco Fire Products, and United Technologies Corp. The foam included perfluorooctanoic acid (PFOA) and perfluorooctane sulfonate (PFOS), and the chemicals caused both groundwater contamination and personal injuries, plaintiffs say. They seek compensatory damages and costs associated with monitoring for cancer and other medical problems. The litigation against the government has proven hard to bring because of governmental immunity and other defenses. Consequently, the residents are pushing hard on their actions against the manufacturers, with a number of new suits filed in recent months. But 3M and other makers are vigorously fighting back. They say the chemicals, which have since been phased out of the foam, aren’t dangerous. They also argue that as contractors of the government they’re protected from liability. Regardless of how the litigation plays out, one thing is clear: The lawyers representing the parties in the litigation won’t be out of work anytime soon. The first suits were just filed in 2016 and additional suits are in the offing, plaintiffs’ attorneys say. In the 1970s, the Department of Defense began using AFFF to extinguish petroleum-based fires, and it was used extensively in fire fighting training on military bases. But after the EPA raised concerns about the persistence, bioaccumulation, and toxicity of PFOAs and PFOSs in the firefighting foam, manufacturers began voluntarily phasing out the chemicals in 2000. In May 2016, the EPA established a Lifetime Health Advisory, setting a recommended lifetime exposure limit of 70 parts per trillion for a combined concentration of PFOA and PFOS in drinking water. That same year, residents living near the Warminster site and the Navy’s nearby Willow Grove base filed the first of several class action suits against the manufacturers of the foam, alleging personal injuries and property damage, and seeking medical monitoring ( Bates v. 3M; Menkes v. 3M, and others). Residents also filed a medical monitoring claim against the federal government. That was dismissed, and is now on appeal ( Giovanni v. United States). But the Warminster and Willow Grove sites are just a small part of a bigger story. Suits have now been filed over alleged contamination from military facilities in Colorado and New York, and more are expected. The Department of Defense, in a report to Congress last October, said it has identified 393 active or recently closed installations with known or suspected releases of PFOS, PFOA, or both. These releases were “primarily associated with firefighting training areas, hangars, fire suppression systems, and aircraft crash sites,” it said. Of those sites, the ones that pose a public health threat are those with drinking water contamination, Lenny Siegel, executive director of the Center for Public Environmental Oversight in Mountain View, Calif., told Bloomberg Law. CPEO is an organization that promotes public participation in the environmental oversight and cleanup of federal facilities as well as Superfund and Brownfields sites. “There are maybe under 100 where there’s a pathway to drinking water,” Siegel said. But residents living near these sites face steep hurdles in suing the federal government. It’s protected from tort liability under a provision for actions involving the exercise of government discretion, which has been interpreted broadly to include damages stemming from a wide variety of activities. “The case law is not the greatest” on this point, so few suits against the government are filed, attorney Paul Napoli with Napoli Shkolnik PLLC in Melville, N.Y., told Bloomberg Law. As a result, plaintiffs are filing suits against 3M and other foam manufacturers, Napoli said. He represents several groups of plaintiffs. 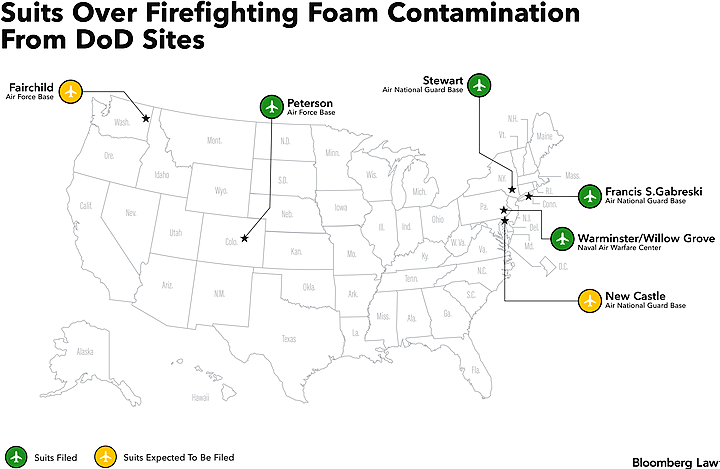 In addition to the Willow Grove and Warminster suits, residents are pursuing a class action against manufacturers over firefighting foam-related contamination from the Peterson Air Force Base in El Paso County, Colo. ( Bell v. 3M). And, in 2017, two separate groups of residents living near the Francis S. Grabeski Air National Guard Base in Suffolk County, N.Y., and the county itself, filed separate suits there, also against 3M and other makers ( Ayo v. 3M; Green v. 3M; and Suffolk County v. 3M). Also last year, plaintiffs filed three class action suits alleging foam contamination from Stewart Air National Guard Base in Newburgh, N.Y. ( Adamo v. Port Authority of New York; Fogarty v. Port Authority of New York; Miller v. Port Authority of New York). Additional litigation is on the way, Napoli told Bloomberg Law. Napoli’s firm will soon be filing suits over contamination from the Fairchild Air Force Base in Spokane, Wash., and the New Castle National Guard Base in Delaware, he said. “This will be a litigation issue that will go on for a couple decades,” Napoli said. “This is the PCB of this century—It’s the only thing like PCBs that bioaccumulates and never leaves your body,” Napoli said. “Our theory is that the defendants never warned the Air Force of the bioaccumulative nature of the contaminants and they misrepresented that they would biodegrade in 90 to 120 days,” he said. But 3M says the allegations are unfounded, and that the firefighting foam has not been shown to cause cancer. “We do not know if 3M will be named in future lawsuits, though we hope it is becoming clear to others that 3M is positioned to prevail in such cases—and many of the existing cases lack merit,” 3M spokesperson Donna Fleming Runyon told Bloomberg Law. “3M sold these products with instructions regarding their safe use and disposal, and the company acted appropriately at all times,” she said. The EPA has identified PFOS and PFOA as “ emerging contaminants"—chemicals or materials characterized by a perceived, potential, or real threat to human health or the environment or by a lack of published health standards. In addition to denying health risks from the chemicals in its foam, 3M has also raised other defenses to the litigation. In the Peterson Air Force Base case in Colorado, it said it is immune from suit as a government contractor. The company’s firefighting foam was made “to military specification or otherwise dictated by federal and/or state agencies, overseen and approved or ratified by those agencies, and/or the subject of federal and/or state statutes and regulations,” it said. Though it is impossible to predict the outcome of the suits, 3M can point to some victories in related actions. In December, 3M and other manufacturers won dismissal of some counts brought by the County of Barnstable, Mass., in a foam suit that doesn’t involve a military site. And in 2016 3M announced the dismissal of foam contamination claims brought against it in the United Kingdom. Meanwhile, the U.S. Court of Appeals for the Third Circuit is set to decide whether to reinstate a suit against the federal government over the Willow Grove and Warminster contamination. This case raises yet another defense to liability that the military might assert, at least at some sites. In the Third Circuit case, Kristen and Charles Giovanni, who live adjacent to the Willow Grove site, filed suit under state law, alleging that the government’s release of PFOA and PFOS from the base contaminated their groundwater and amounted to a disposal of hazardous substances. In July 2017, a federal trial court dismissed the suit. Requiring the Navy to pay for medical monitoring and conduct a health effects study would interfere with cleanup activities being conducted under the federal Superfund law, the court reasoned. The government, in a Jan. 24 brief, asked the Third Circuit to affirm the dismissal.